Happy Monday! Did anyone see the Super Moon? It looked like God left the light on last night. This weekend we continued the master bathroom remodeling project by installing picture frame moulding. We are getting SO close! The plumber is coming this Wednesday to install the shower and tub hardware. In order for the plumber to set the claw foot tub into place, we needed to finish the walls behind where the new tub will be located. Just the motivation we need! We finished sanding and found the paint can labeled white interior trim paint. We painted the walls and all of the baseboard trim with two coats of paint. It looked yellow next to the new Carrara marble floor tiles. We thought once it dried it would look more white. What did it look like the next day? Yellow. Come to find out, the trim color in the rest of our house is really a creamy white called Princeton White. It was the builder’s color choice and it looks more white in the rest of the house. In the bathroom it looked yellow. We knew it would drive us crazy for the color to be so off. So, back to the paint store. I bought a gallon of the whitest white I could find. It’s Designer White by Clark & Kensington in a semi-gloss. It’s described as “a cool white with a pale shade of gray.” Below you can see the difference between the new white painted over a bit of the builder’s white. Much better! The chair rail went up like a charm! We re-rolled the walls and painted the baseboards and chair rail. Four coats of paint in all. (We consider the first two primer coats now.) We had to paint the window and door trim too. Sigh. Since nothing in this house is square the picture frame moulding was tricky, especially around the window. After each box was complete and my husband was cutting the next box, I puttied the nail holes and painted. The trim work took most of the day with lots of trips up and down the stairs and tons of squats! I admit we are both a bit sore today! This type of project really needs four hands. At least for do it yourselfers! I would hold the level and a piece of the moulding while my husband glued and nailed them into place. Typical with any of our projects we are several pieces of trim short of finishing the project. Back to Home Depot! The walls in the picture below look gold. The color is more tan, which I painted before we decided to remodel the ENTIRE bathroom. In hindsight I should have gone with a soft pale gray, but that ship has sailed. Repainting this room again is NOT happening. We couldn’t resist hauling in the tub to see what it will look like. We have a wall and a half to go. (to the right of the tub) My goal is to get it finished before the plumber comes. 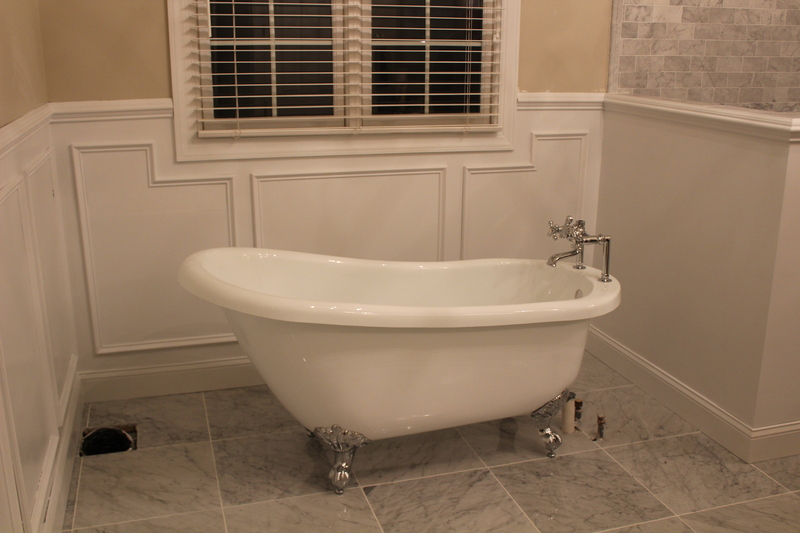 I have a feeling once the tub goes in it will be a tight squeeze to paint or do any trim work. I think it looks great so far! Plus we saved a ton of money doing it ourselves. We will have the glass enclosure installed Thursday and by the end of the week we will have a fully functioning bathroom! I still need to paint the vanity and the countertop. That may happen after the rapidly approaching Thanksgiving holiday. We are hosting at our house, so I’d better get busy! At least we won’t have a bath tub in the middle of the guest room! Hope you have a wonderful day, friends! Thanks for stopping by! Ebay Chandelier rewired and ready to go! ReColor! As Seen on TV! Coffee Table Restoration…a Forty Dollar Gem! Adorable DIY Baby Shower Favors!